Longitudinal rip resistance that is more than five times stronger than multi-ply belts. Excellent in mining, quarry, wood, paper and pulp, recycling, road construction, steel and transshipment industries. The UsFlex carcass is based on the straight-warp principal. In some applications, especially primary and secondary crushers, even the strongest and heaviest conventional belts can be ripped or torn by large lumps of heavy, sharp objects, either falling from a height or becoming trapped. Belts can often be destroyed within a matter of weeks or months. The Dunlop solution to this problem is UsFlex, which has longitudinal rip resistance more than five times that of multi-ply belts of equivalent rating because of our unique straight-warp construction. UsFlex provides impact resistance up to three times greater than that of conventional plied belting. This unequaled toughness means the belt will not be easily damaged in the loading and conveying of large, sharp material. As a result, UsFlex will provide the longest belt life in the harshest conditions! UsFlex owes its outstanding impact and tear resistant characteristics to an innovative woven straight-warp carcass that is unique to Dunlop. This consists of heavy strands of polyester running lengthwise and heavy nylon strands running crosswise held in position by a strong yarn. The strands are completely straight in both directions and not interlocked as in a conventional belt carcass. This allows the weft to float free from the warp, thereby minimising the peak point of impact because the energy is absorbed over a larger area, providing maximum protection to the carcass. Suitable for use in all areas, especially in high impact conditions and low maintenance environments including the mining, quarry, wood, paper and pulp, recycling, road construction, steel and transshipment industries. The UsFlex carcass is based on the straight-warp principal and can be supplied in either single ply or two-ply versions. Contact us We are making the longest lasting conveyor belts! The ‘secret’ behind the amazing rip resistant characteristics of UsFlex is the use of a unique and innovative ‘straight-warp’ woven fabric ply. This consists of heavy strands of polyester running lengthwise and nylon running crosswise. The strands are completely straight in both directions and not interlocked as in a conventional belt carcass. This allows the weft to float free from the warp. This means that if a sharp object penetrates the carcass the nylon crosswise strands have the strength and ‘freedom’ to compact (gather) together, effectively forming an increasingly stronger barrier. It is a broadly similar principle to that of a fabric rip-stop breaker ply but significantly stronger and more effective. Compared to conventional multi-ply and solid woven belting, the impact resistance of UsFlex is proven to be significantly superior. This is because the unique UsFlex design minimises the peak point of impact and absorbs (dissipates) the energy over a larger area compared to a conventional high tensile EP or EPP belt. For example, a single-ply UsFlex type 630/1 has the impact absorbing qualities of a 4-ply EP belt type 1600/4 or an EPP 1250/2. 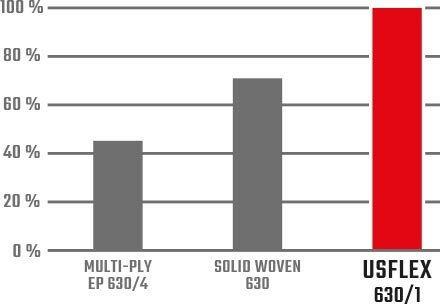 The chart shows the results of impact tests on 630 rated UsFlex, Solid woven and multiply belting. The tear resistance of UsFlex, measured according to the international EN ISO 505 standard, also significantly exceeds that of conventional multi-ply belts with comparable tensile strength. Tests for rip and tear resistance are only made on the actual belt carcass so the top and bottom covers are always removed. This ensures that the thickness and quality of the cover do not influence the accuracy and consistency of the tests. For belts operating in demanding conditions having the strongest possible splice joints while still retaining the maximum amount of tensile strength is even more important than usual. A conventional step splice or fastener will always create a proportional loss of tensile strength. At Dunlop, we recommend the finger splice method that creates the strongest and most reliable joint possible (up to 90% of the belt’s original tensile strength). It's not a problem for Dunlop Steelcord Belts! 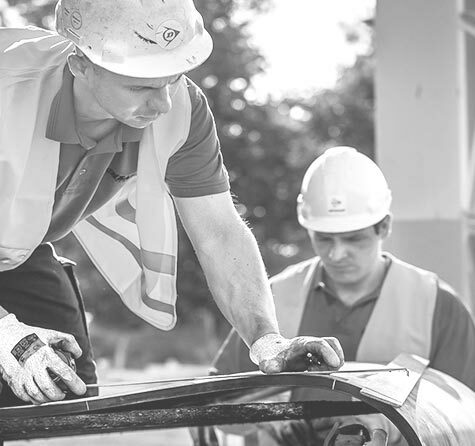 To provide optimum carcass protection, Dunlop RS covers are fitted as standard because of its excellent resistance to cutting combined with outstanding resistance to abrasion. 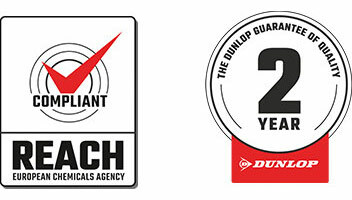 Dunlop RS signifi cantly exceeds the highest abrasion standards for both DIN W and the equivalent ISO 'D'standard. Other qualities, such as oil, fi re and heat resistant covers are available. 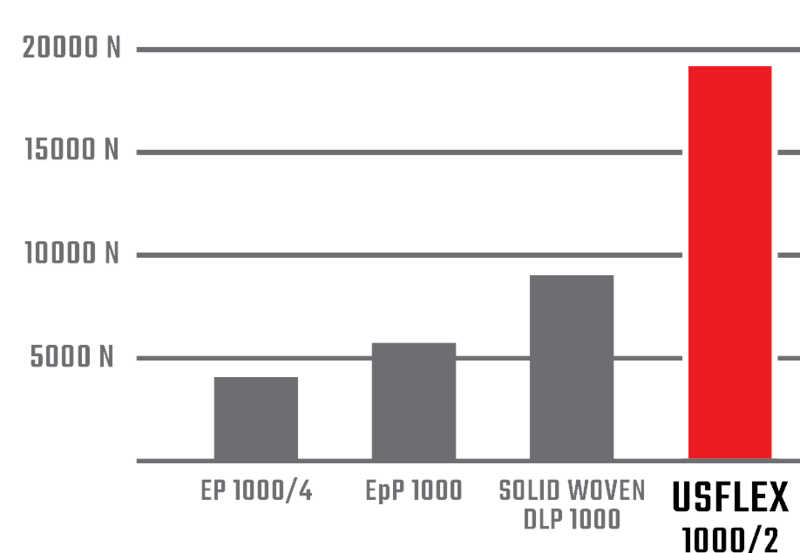 All Dunlop cover qualities are anti-static according to EN ISO 284 and are extensively ozone tested in compliance with EN ISO 1431 ozone resistance (50 pphm, strain 20%, 96 hours no cracking) and resistance to the damaging effects of ultra-violet in order to avoid premature failure due to cracking of the belt surface.